ANA will begin rolling out its new premium economy seat from this September, on routes from Tokyo to cities including New York, London, Frankfurt and Paris. The Japanese carrier currently offers premium economy on routes from Tokyo Narita to Chicago, Washington DC and Munich, and from Tokyo Haneda to LA. The food service in these cabins is set to be enhanced from June 1, with sparkling wine and soup offered in addition to the current regular economy food and beverage. Then from September ANA’s newest premium economy seat will be “introduced sequentially on routes between Narita and New York, London, Frankfurt, San Francisco, Los Angeles and Paris”, with the rollout set to be completed by the end of 2012. The new seat (pictured below) has a pitch of 38 inches and a width of 19.3 inches, and will be configured 2-4-2. 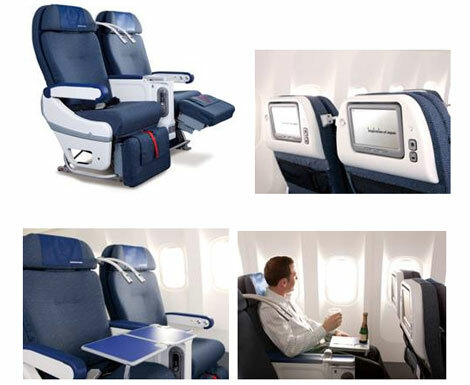 Other features include head, leg and foot rests, a central arm rest with cocktail tray, a 10.6-inch TV screen (12.1 inches in the first row of the cabin), PC power sockets, and USB and iPod ports. Premium economy passengers also benefit from lounge access at Tokyo, as well as priority check-in and baggage handling. For more information visit ana.co.jp.